It has been a while since I released a new tenkara rod here at Tenkara USA. The last time was the release of the Sato and Rhodo some 4 years ago. I am a strong believer that companies shouldn’t release new products simply with the goal of loading people with something new. Too often a need for growth rather than customer interest is what drives product releases. But we were missing a product that I feel completes our lineup. I wanted to create an adventure rod. It would be strong to handle just about whatever was thrown at it in terms of fish; and it would be super portable but not compromise durability or feel. At last that rod is here. The Hane (pronounced “huh-neh”, and Japanese for feather) is that rod. It’s a new take on a rod I made many years ago for Backpacking Light, a rod that had a good following and needed to exist. If you are interested in a rod that will fit in your small carry-on when you travel, your daypack when you go for hikes, or your bike’s saddlebag, check out the Hane ($150). It is a great rod to tag along in all your adventures. New Podcast Episode and news! Got some news about the book: the files have been sent to the printer!!! YEAY! We are told about 2 to 3 weeks for delivery. The book will be printed in Denver, so I’ll be going to the press checks and keeping an eye on it as it comes out. I’ll be sending out a survey to ask for addresses from those who have pre-purchased it. Meanwhile, as Jeremy worked on wrapping the files up yesterday I recorded a new podcast episode, in which I talk about my favorite rod, the Ito. The Ito is The Ito is my favorite as well as that of many of the most experienced tenkara anglers. Yet, people are intimidated by its length. Listen to this episode to learn about what makes the Ito a favorite of so many anglers and why you should give it a try! Unfortunately the Rip’Em & Lip’Em videos I mentioned are no longer available on Youtube, I’m trying to get the video files to share soon. This is an update on tenkara – the book, which will soon be arriving. The book is now in its final stage before we print it and mail it. Thank you for your patience! After seeing the near-final product I can promise it will be worth the wait! Over the last two weeks I holed myself up and focused exclusively on finishing final text revisions for tenkara – the book. The current version is looking so much cleaner than how it started. I don’t say this easily very often about my own work, but I am very proud of how this book has shaped up. On Wednesday the book designer and illustrator, Jeremy Shellhorn, flew over to Boulder and we got to work together non-stop on the book. It was 3 long days of doing the final layout, placing the final images and touching up every single detail on every single page we touched. It was quite a amazing experience to see Jeremy do the work in front of me and bring words and photos to life in a way that just feel so…tenkara. We did a Facebook live video when we started working on it yesterday morning where we show a bit of what we have done. The most interesting thing was our process in this last leg of the journey. We sat next to each other at the office, I would send him sections of text that were finalized and he would lay them out with the suggested photograph. But, because Jeremy knows our photography portfolio and tenkara so well, he would remember images that could be even better in a certain section. I’d find the image and send it to him and we would see how it worked. Other times we explored the text and found better, usually simpler, ways of saying things. This is a big contrast with traditional publishing, where the publisher requests that the text and images be completely done and sent over, then there are some several rounds of back and forth between author, designer, editor. In our case, the instant collaboration on every single page of the book has undoubtedly created a better produce. We can not begin to imagine doing this phase in any other way. I expect about 5 more days to send the file to the printer, then about 3 weeks for it to be ready to ship. So, we are looking at approximately March 15th at the moment. I feel embarrassed that I originally promised the book would be in your hands in January and I didn’t get it ready on time. I am not sure I underestimated the scope of this project or whether I just kept finding ways to make it a better book. This has been the toughest thing I have ever done, but I am incredibly excited about how it is turning out. I do apologize for the delay, if any would prefer a refund for me not meeting the timeline, I’d completely understand. Now the finish line is very clear and we are just about to cross it. tenkara – the book will be something you’ll be very happy with. Next time you hear from me will be to get your address. A little while ago we updated our tenkara rod cases. If you are interested in getting one of the new Tenkara USA rod cases to upgrade your existing one, these are now available here. They will be sold at a discounted price of $15 for the next two weeks to give you a chance to get them for an upgrade. These cases all share the same cap thread, but the rod name is printed on the cap. The rod cases also come with a stretchy woven rod sock. It’s been overdue for sometime, we know. But, I’m happy to announce we finally built up the functionality on our website for you to download the digital version of the Tenkara Magazine. You can order the 2014 and the 2015 versions online. The 2015 is available in two electronic formats, one is the original layout of the magazine, the other is a narrow layout optimized for reading on a phone or tablet. Either costs $4.00 (print version is $9.00). The 2014 magazine is only available in one electronic format, the original layout, and costs $2.50. The much anticipated 2015 Tenkara Magazine has arrived! The second annual issue of the Tenkara Magazine has an incredible lineup of stories, how-to articles, and tenkara photography. This high-quality print publication is intended to continue sharing the tenkara story and features pieces submitted by the tenkara community and curated by the Tenkara Publishing team. And, yes, this issue also has larger font size! A digital version will be made available in February/March of 2015. It’s been a long-time coming and with many requests from our customers. We have been working for a while on putting together a tenkara fly-tying kit that has everything you need to tie a variety of tenkara flies, and nothing you don’t need. The Tenkara Fly-Tying kit is our way of showing you that fly-tying is actually pretty simple. Both kit options feature a booklet we created to teach you how to tie tenkara flies as well as a vise (two options available), a set of tools, soft-hackle, dry rooster hackle, peacock herl, two spools of thread and 50 hooks in two sizes. There are also a lot of resources we’re putting together to help you get into fly-tying, such as our weekly Tenkara Fly-Tying Video Series, with one video released every week. Both kits feature enough hooks to tie 50 flies, and materials for more, so it would pay for itself pretty quickly compared to buying flies.Kits will start shipping on December 16th but order now to make sure you get one. The Basic Tenkara Fly-tying kit features a spring-action vise by Terra. This vise is great for beginners as it requires no adjustments, all you do is press the lever to open the jaws and put whatever size hook you are using. This is a clamp-style vise, which you will clamp onto a table/desk. All materials are the same as in the Upgraded kit. Ships December 16th. The Upgraded Tenkara Fly-tying kit features a high-end vise made by Peak Fishing in Loveland, Colorado. It’s a pedestal-style vise, which can be used on any surface. It is a beautifully crafted vise made in the USA. All other materials are the same as in the Basic kit. Ships December 16th. DVD: Discovering Tenkara now available! It is finally here! The much anticipated USA version of the DVD Discovering Tenkara, volume 1 has finally arrived at our warehouse and is ready to order. Filmed on picturesque British upland streams and presented by the UK’s first certified Tenkara Guides – Paul Gaskell and John Pearson – this volume demonstrates key elements of the method that is “Japanese tenkara” – its history, philosophy, equipment and flies. 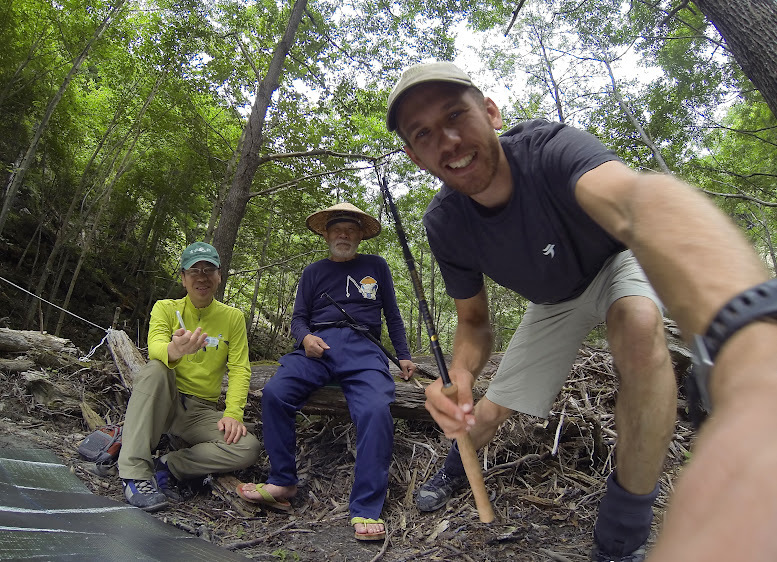 Join the Discover Tenkara Team together with Japan’s foremost tenkara expert – Dr Hisao Ishigaki – for a look at the fundamental elements of this beautiful and effective fly fishing tradition. New Tenakra USA Rod Models from MidCurrent on Vimeo. 1) The More You Know the Less You Need: Some specific examples of things which tenkara show you you do not need. 2) Tenkara Podcast: If you’re looking for something to listen to while you drive or work, checkout the first Tenkara USA podcast which we recorded with Jason Klass from Tenkara Talk. 3)Tenkara Testimonials: With the Fly Fishing Show season just about to start again, checkout this video we made the last year’s Fly Fishing Show where we asked people what they thought about tenkara. 4) In Search of Tenkara [VIDEOS]: In 2013 I made a series of 3 videos titled “In Search of Tenkara” where I tried understanding more of what made tenkara, tenkara. 5) The Last Commercial Tenkara Angler, Bunpei Sonehara: one of our most popular posts this year was the story written by Bunpei Sonehara, largely considered to be the last commercial tenkara anglers in Japan. We translated the story to give folks a glimpse of what tenkara was like back in the day. 7) 2013 Japan Trip, 1st photographs: Every year I go back to Japan to learn more about tenkara and share its story here. This is my first post of this year’s trip. I love the photographs and memories of that trip, which I took with Mr. Yuzo Sebata. 8) Tenkara Flies Map: A map with the placement of some of the most recognizable tenkara flies of Japanese tenkara anglers. 9) Shower Climbing (Canyoneering) and Tenkara: This is probably just my personal favorite as it combined two of my great passions, climbing adventure and tenkara. 11) Release of two new rods, the Sato and Rhodo triple-zoom rods: After 2 years of working on 2 rod models, we were finally able to release them. Very proud of their successful launch. 12) Tenkara Magazine: another successful item, we finally created the first magazine in the world dedicated exclusively to tenkara. Very proud of that 2013 accomplishment.